Pickups pick up(!) the string vibration in a magnetic field and turn it into an electrical signal which goes to the amplifier. 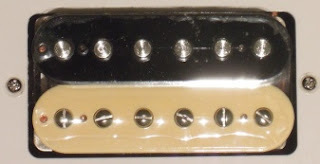 The two most common types are the single-coil and the humbucker (a doubled-up single coil). Single coils are known for a bright jangly sound; famously the Fender Telecaster and Stratocaster, and humbuckers for a darker sound; classically on the Les Paul. This rather long and technical article gives an explanation on how a lot of that difference arises from the way humbuckers are usually wired. What it comes down to is really the higher inductance pickups will sound darker and putting them in series (one-after another) produces what is effectively a higher inductance pickup. There are two ways to get a more single-coil like sound out of a humbucker, if you have a four-wire version: coil tap (basically use one coil) or wire in parallel. It isn't the whole story, for example the larger humbucker covers more of the strings and the coils are constructed differently, but it is an important part of it. My goal here is to make my guitar a bit more versatile without changing it too much—no cutting holes in the scratch plate yet. Since the IronGear pickup in the bridge was pretty successful their Jailhouse Rails were the obvious next step. These are humbuckers the size of a single coil pickup, which meant it could be swapped for the neck single coil on my Pacifica (if you want to spend more or get more choice, you might look at Seymour Duncan or DiMarzio, most boutique makers don't do them). It's a more square than a single-coil, so IronGear warn you might have to file out the space a bit, but on the Pacifica they just about squeezed through without that. 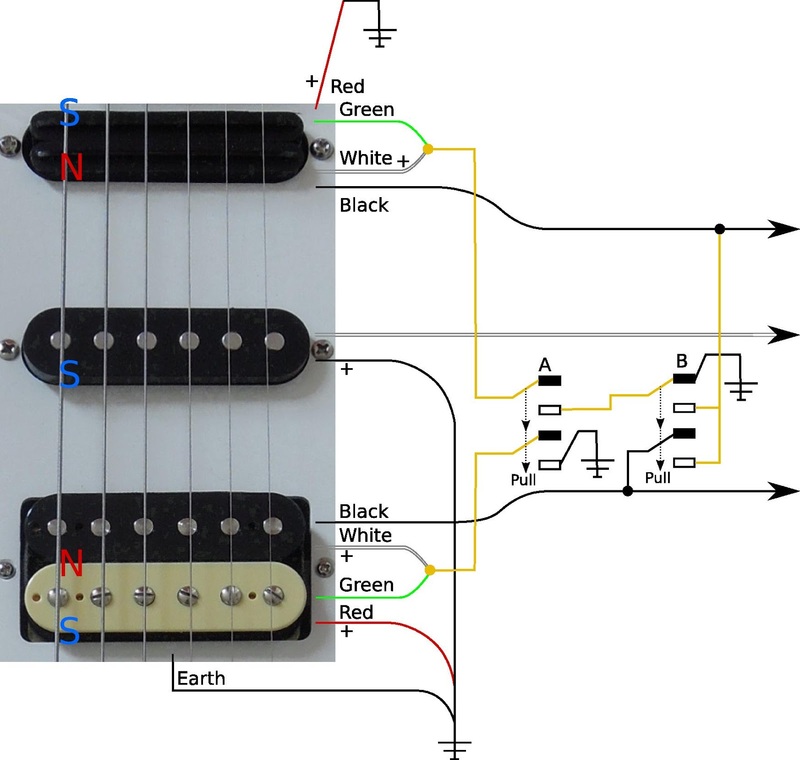 A 5-way switch, 3-pickup guitar (or, classic Stratocaster) switches from bridge to middle to neck pickup, with in-between positions bridge plus middle and middle plus neck. A 3 position switch, 2-pickup guitar (classic LP) switches from bridge to bridge to neck pickup, with bridge plus neck in-between. In both cases 'plus' means in-parallel. The tone knob on this guitar can be replaced by one with a push-pull switch. Destination: allow switching between the Stratocaster and LP in-between positions. Via: We might as well allow a split-coil on the neck pickup too. If I was willing to cover the guitar in switches then I could allow all kinds of combinations, but I'm limiting myself to two push-pulls. That rules out parallel/series humbucker switching, since it needs both sides of a DPDT switch to do one humbucker. It's also one reason I mentioned inductance above. High inductance pickups are usually thought of as high output, but if you put a high-inductance pickup in parallel with a lower inductance one the lower inductance pickup usually dominates the sound (because each pickup 'loads' the other). Ideally you have them matched. The least useful of the possible combinations is therefore switching the coil split individually, with both humbuckers engaged then it's better to have them both full or both coil-split. That's the goal. If you've travelled on British trains you'll know things don't always go smoothly. The complication is single-coil humbucking. By single-coil humbucking I mean the combined pickup positions can be a humbucking combination to reduce noise. If you're wiring the pickups in phase (and I am) what you need is the combined pickups to have opposite magnetic polarity. The middle pickup is south (well, south on top), so when running split-coil it needs to combine with the bridge north or the neck north. What happens when combining the bridge and neck pickups? North plus north? It's not critical, but it would be nice to be humbucking in this mode too. It turns out to be possible that in switching to bridge plus neck it's also possible to change which coil is used. The final picture after all this worrying is quite simple. Add a push-pull switch that joins the bridge and neck hot leads together. Doing that means the bridge or neck positions on the 5-way lever become bridge plus neck, it also adds a bonus: the neck plus middle and bridge plus middle positions become neck plus middle plus bridge. One downside of doing this is that it would have been nice to have had the 'pointing' of the 5-way lever naturally swap to the 3-way pointing (neck plus bridge in the middle), that can be done, but all three pickups is a nice bonus and it also allows another trick. The new push-pull switch is double-pole, which means that as well as joining neck to bridge it can also switch the coil-split for the neck pickup from earth to hot, this changes which coil is shorted by the coil-split switch and which one stays active. I've done this with the neck rather than the bridge pickup because there'll be less difference in the sound of the two coils at the neck rather than the bridge. stock pickup 'hot' here is actually '-'. A diagram should make it clearer. Switch A coil-splits when pulled, switch B joins neck and bridge in parallel and changes the neck single coil from N to S.
"The bit with the pictures." You can draw as many neat schematics as you want, but those lines all translate into wires and solder. Here's another reason for keeping things simple, that silver backing on the scratch-plate is about the size of the Pacifica's electronics cavity. Start cramming more things in and you quickly run out of space. One thing that's tricky is those 'earth points' that get soldered onto the back of pots. It's good to have a solid one with all the earths coming to a single point as it cuts down noise. However a massive blob of solder on the back of a metal potentiometer can be very hard to melt if you want to work on it later. The best solution is a copper tab soldered to the back of the pot, which you solder the other wires onto, not having one to hand I've used a double thickness of tinned hookup wire. The nice orange capacitor is a Sprague 22nF tone capacitor. I took the opportunity to replace the standard one in the Pacifica 112, though I found out that was already a 22nF, while diagrams for the 112J show a 47nF. The old potentiometer turns out to have been a 250k log pot rather than the linear one I was expecting, my push-pull replacement is a 250k linear pot. The log pot was a better choice, but I can live with the linear one for the moment. With everything squeezed back into place the guitar doesn't look much different. Maybe the rails don't quite match the vintage look of the rest of the finishing (and maybe I'm harbouring cosmetic plans about that), but the sound though is very nice. The Jailhouse Rails pair well with the Hot Slag and deliver a sound with a solid bass punch, but that's still articulate and lets highs come through. Switching on the coil-split in that mode gets an even brighter sound, while putting in the mid as well warms things a little. On their own the rails work nicely, with a thick but clear sound on full and brightening up again in coil-split. The different noise cancelling modes all work turned up loud, while there's very little noise overall, despite all the cables and unorthodox earth. That's probably enough gear posts for a while, back to some interesting developments for music on Linux shortly.